Please rotate your device to portrait. 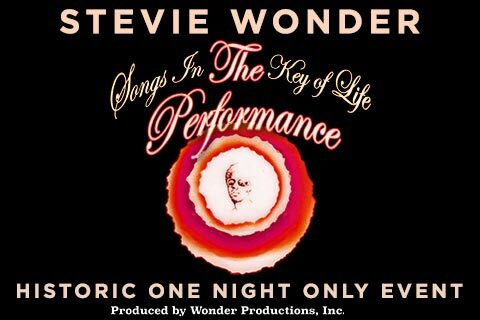 Stevie has announced the extension and final run of dates for his SONGS IN THE KEY OF LIFE PERFORMANCE tour due to popular demand! He will bring the critically-acclaimed performance, which is a live adaptation of the iconic Songs in the Key of Life album, to 20 North American cities beginning September 30 in Montreal, QC. Produced by Wonder Productions and Live Nation and promoted by Live Nation, the tour will continue to cities such as Washington, DC, Philadelphia, St. Louis, Toronto, Chicago, Detroit and Kansas City before concluding in New York City at Madison Square Garden on November 24. Citi card members will have access to pre-sale tickets beginning Tuesday, August 18 at 12:00 p.m. local time through Citi's Private Pass Program in select cities. For complete pre-sale details, visit CitiPrivatePass.com. General tickets for select cities will be available on LiveNation.com beginning Friday, August 21 at 10 a.m. local time. Please see below for full details. These 20 dates follow the tour’s initial extended run of dates in March 2015; those dates were added as a result of high demand from the tour’s initial run in the late fall of 2014. While returning to many cities, many fans will have the chance to see the show for the first time in their area. This leg will mark the final performances in a live tour setting in the U.S. The final show at Madison Square Garden will bring the tour full circle as Stevie concludes the tour at the same venue it began on November 6, 2014. September 30 Montreal, QC Bell Centre Friday, August 21 @ 12 p.m.
October 3 Washington, DC Verizon Center Friday, August 21 @ 10 a.m.
October 7 Philadelphia, PA Wells Fargo Center Friday, August 21 @ 10 a.m.
October 9 Toronto, ON Air Canada Centre Friday, August 21 @ 10 a.m.
October 11 Hartford, CT XL Center Friday, August 21 @ 10 a.m.
October 14 Newark, NJ Prudential Center Friday, August 21 @ 10 a.m.
October 16 Chicago, IL United Center Saturday, August 22 @ 10 a.m.
October 19 Pittsburgh, PA Consol Energy Center Friday, August 21 @ 10 a.m.
October 23 Kansas City, MO Sprint Center Saturday, August 22 @ 10 a.m.
November 3 Oklahoma City, OK Chesapeake Energy Arena Saturday, August 22 @ 10 a.m.
November 5 Little Rock, AR Verizon Arena Saturday, August 29 @ 10 a.m.